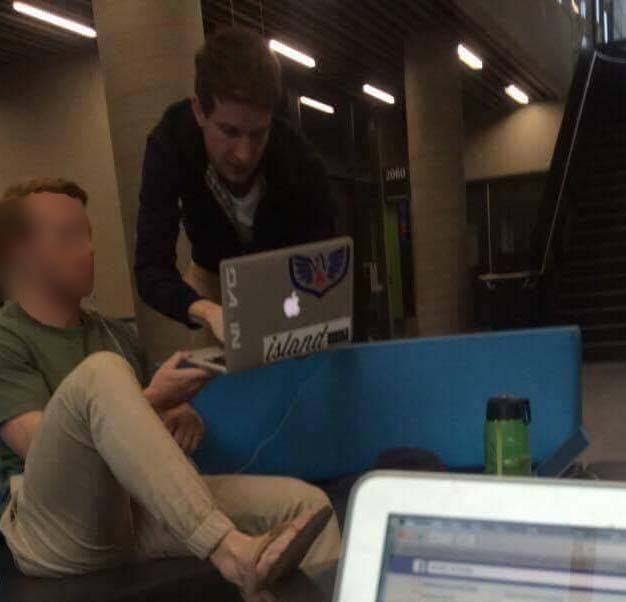 Campus security were called to the Sydney University School of IT today after a physical altercation broke out between James Flynn (a campaigner for Senate candidate Colin Whitchurch) and a student. The student told Campus Security that Flynn attempted to knock his phone out of his hand as Flynn was canvassing votes. Honi understands that a police report has been filed over the incident. “Flynn approached me…was asking me to vote and asked if I was an undergraduate. He got me to log in and select Colin Whitchurch as the first preference. I brought out my phone to take a photo”, said the student. Flynn denied this and said he was “harassed by a group of students”. “I was trying to talk to students and then a group of students tried to accost me”. He denied campaigning for votes and denied breaking regulations. Honi has seen footage of corroborating evidence of the altercation. Other students witnessed the scene and confirmed the facts. “We heard a commotion and turned around,” said one. “[The student] was about to leave and James was following him. They were involved in some kind of tussle. James was pushing him and they were shouting at each other. The student said they knew and recognised Flynn: “I said ‘James Flynn?’ And James looked at me. And he was startled and ran off”. This comes only days after Honi published that both Colin Whitchurch and James Flynn were caught soliciting votes in breach of regulations. Flynn could not confirm or deny what happened to the mug. When asked if he saw a mug on the floor he replied, “no comment”.